Also now that we are renting our home out, I thought it would be good to take some photographs of it to remember it by. This is the first NEW home we have owned. And we put a lot of thought and loads of effort and plenty of money into making it our own. We have everything from dual switches in each room so you can switch off the room lights while lying in bed (lazy bums that we are), to amazing kitchen/dining appliances and layout (my uncle calls it my “command centre”), to double-volume bookshelves which can ALMOST hold all our books (we have more bookshelves in the bedrooms), to hide-away work stations. 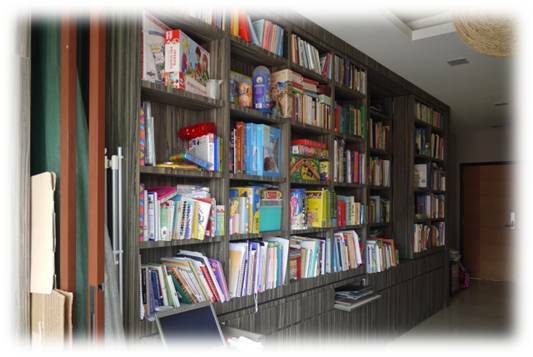 First up, the infamous double-volume bookshelves which take pride of place in our living/dining area. If you look at the bottom of the photo, you will see my laptop open in one of the hideaway workstations we had built into the book cases. TC’s workstation, towards the middle, is half opened. TC earned himself the nickname “Power Point King” for having the electrician install sockets all over the place! Behind each workstation is a pair of sockets for laptops/phone chargers/printer, etc. Lots of the stuff on the front shelves are non-books because when we filled them up with books, they were a little heavy for the kids to push. So we interspersed books with kits and other boxes there instead. But the back shelves are all books. We had the contractors knock down the kitchen walls so we could have an open plan kitchen with the dining table incorporated. We had Hoffen design and build our kitchen, preferring a specialist in kitchens over a general interior designer/contractor. No regrets. They can be found at www.hoffen.com. After I took the photo I realised that I hadn’t arranged our fancy Kartell chairs, so all you see in the photo are our kids’ IKEA chairs. 🙂 Ah well … If you’re keen to see what we bought, go to www.kartell.com and look for the “Frilly” chair. Our fridge is from Blomberg. I know. No one has heard of it. German brand. Been around a LONG time, just not in Singapore for very long. Agent is on the 5th floor of Centrepoint. This side-by-side cost us 5k, which was cheaper than an Amana and the same price as the high end Hitachi! There is a little door that opens to the drinks compartment so you don’t have to open the whole fridge for drinks. But the thing I liked most was the layout and shelving in both the fridge and the freezer. Very well planned. 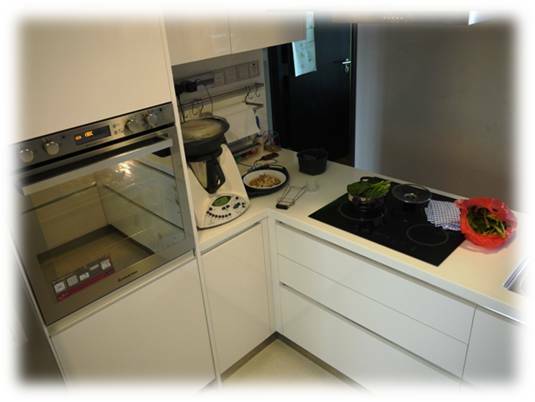 We bought our kitchen appliances from Ariston because I was in love with their Open Space oven! It is divided internally into two sections, which you can use separately (saves electricity) or together if you want to bake cookies (it can do 4 trays evenly and simultaneously!) I use the smaller section of the oven all the time – baked pasta, toast, warming up left over pizza, etc. And the larger section when I make two pizzas. Under the oven is a concealed dishwasher, also from Ariston. Yes, that’s an induction stove and yes, I love it! Didn’t want to use gas because I didn’t want to dedicate a cupboard to the gas tank! In the middle you can see my wonderful Thermomix. 🙂 I think I had something steaming on the top when I took this photo. Oh yes … left over chicken rice. 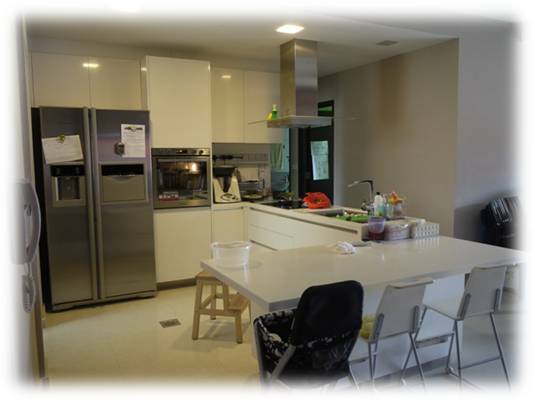 🙂 On the wall behind the Thermomix is the Eubiq Power Outlet System from www.eubiq.com. You can buy them from hardware stores like Home Fix, but the standard lengths didn’t work for us so we had them come down to customise it. Very neat system! We thought long and hard about what sink to get. After all, I WAS going to be spending an inordinate amount of time at it every day! 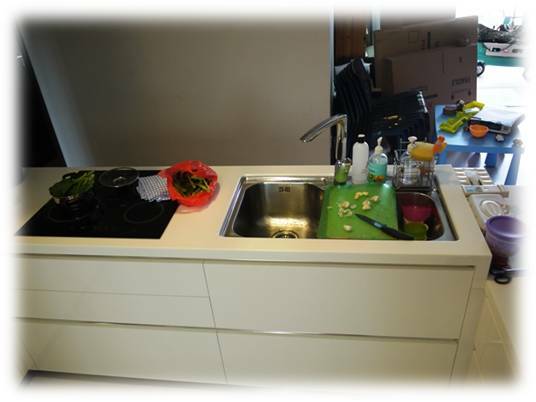 The designers (both our interior designer and the kitchen designer) said we only had space for a very small sink – say 50 to 60 cm wide. But I really wanted something bigger, so ignored their advice and went with one more than 80 cm wide, which reduced the counter space I had for prep work. But the Blanco Plenta sink we bought (www.blanco.co.uk/products/sink/blancoplenta), had some cool accessories including an over-sink chopping board, so this wasn’t a problem. Sink was from Hoe Kee Hardware (www.hoekee.com). I said earlier our kitchen was designed and built by Hoffen (www.hoffen.com). But I really should give myself more credit here. It was designed by ME, and built by Hoffen. 🙂 They did a fabulous job getting all the things on my wish-list included in the kitchen, right down to under-skin drawers, inner-drawers, dining table with under-counter socket, and more kitchen appliances than I thought possible. The kitchen, sans appliances, cost us over 9k. We had a platform bed built in the room because otherwise there would not have been enough room to house all the kids. 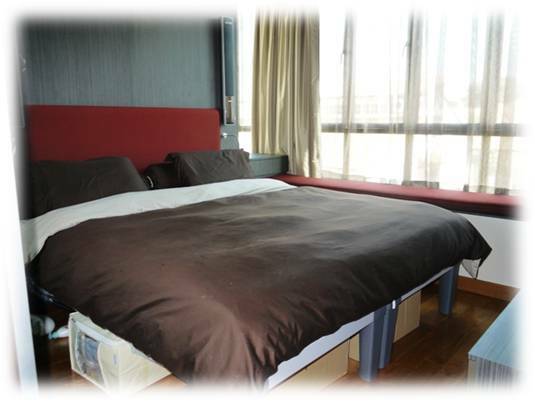 It is now a 9 foot wide bed with plenty of room to spare! I had the mattresses (there are two 4.5 feet wide ones) custom made at Courts Tampines. Practically all the brands there will custom make a mattress for you and will typically charge you 20% more than the closest standard size to do so. For various reasons we now cannot remember, we went with King Koil. The bedsheets were also custom made at Robinson’s. I bought Queen-sized flat sheets and paid $7.50 to have each sewn into 4.5 feet wide fitted sheets. Actually I was pleasantly surprised at how reasonable the sewing charge was! This the the view from the doorway. Notice more bookshelves? 🙂 And no, my kids do not hit their heads on the bookshelves. I get that question all the time. Another view from the doorway, this time you can see the whole bed, with the storage boxes underneath. I had the carpenters build 5 roughly squarish boxes with castors underneath, which I assigned to each child (with one to spare). Into these boxes, they were allowed to store just about anything. As long as it was out of my sight, I was a happy mummy. 🙂 Oh, and no, beyond those boxes, I do not have more storage space further in under the bed. I figured that if I had pull out all the boxes and crawl all the way under there to retrieve something, I probably wouldn’t need it. 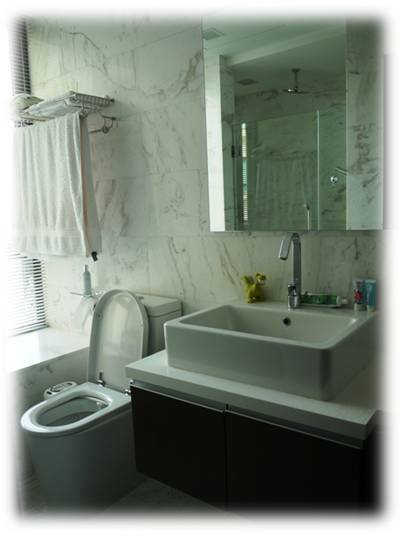 A surprisingly large bathroom for a small apartment. 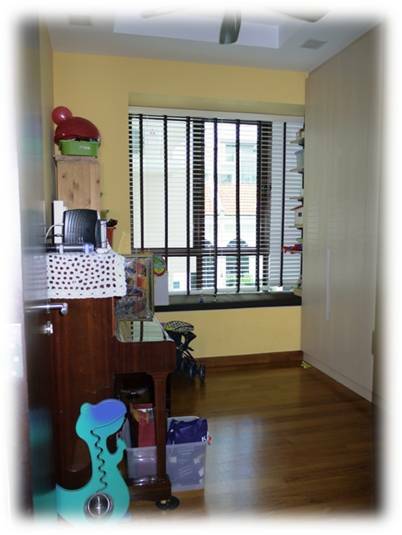 We had two stainless-steel double towel rods from Song Cho (www.songcho.com.sg) installed so that there would be space for towels for all 4 kids. 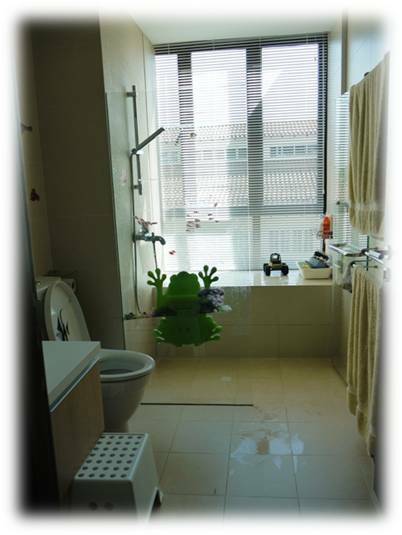 That green frog is by Boon (www.booninc.com/products/FrogPod, cute huh?) and from Howard’s Storage World at Harbourfront. 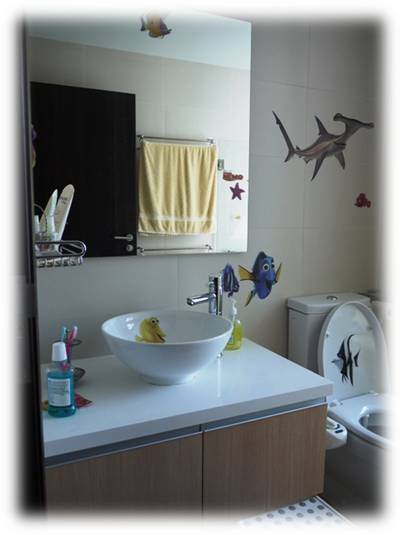 The Finding Nemo wall stickers were from an aunt, and were put up by the kids together with some friends. I figured it was a good way to keep them entertained, and let them just go crazy with it, knowing I could always remove them afterwards. Ha ha. I never did though. This is Daniel sqatting at the door to the sunken bathtub and shower. Our kids have had many hours of fun here. Let me say again … MANY HOURS! LOL! Welcome to our home entertainment centre. Aka the Master Bedroom. Just under the TV is a stack of Daniel’s cloth diapers which I admit I had to straighten before taking the photo. To the left of the TV are more bookshelves. We really put in as much storage space as we could! A different view of the room. We have black0ut curtains in both the bedrooms. Makes for wonderful sleep. Sometimes too much because we can’t tell it’s day! 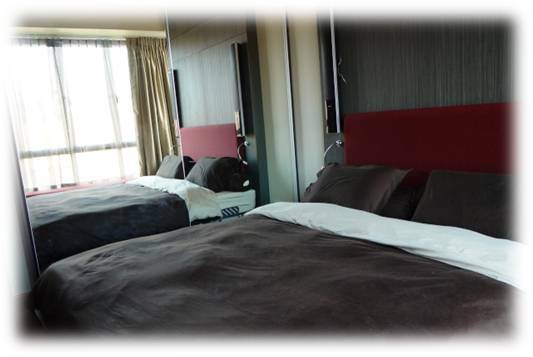 The curtains are in 3 layers – the day curtains and the night curtains which are sewn together with a blackout layer. This is the view from sitting at the bay window, with the bed reflected in the mirrored doors of the Hoffen wardrobe. If you look carefully … very carefully, you will see a reading light sticking out from just under the tower speaker. We had the electrician copy these reading lights we’ve seen in hotels. He used an LED bulb which is more than bright enough to read by, but which keeps the rest of the room in relative darkness so that the other person can sleep undisturbed. Sheets are from the Hotel Collection in Robinson’s. We call this room the “Yellow Room”. 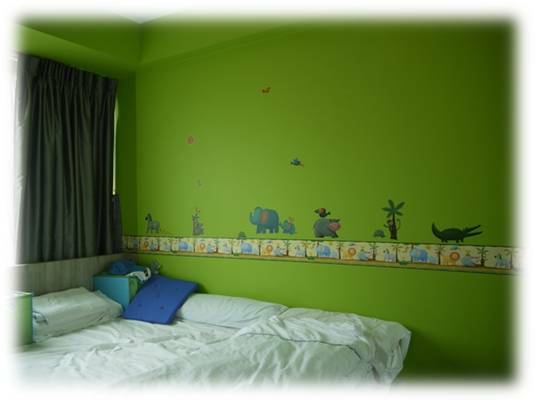 It is a play room and piano room, and though it looks really small, I am surprised again and again by the number of children happy to sit around on the floor to play together. The wardrobe is by Hoffen. Notice the single piece door from floor to ceiling? Not many companies can do that. 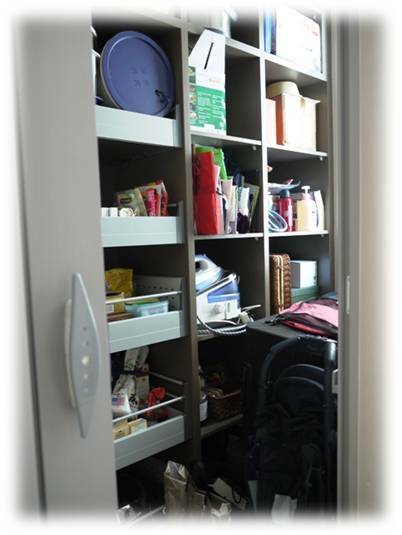 It makes the cupboard look so much neater without the need for another upper door. The wardrobe was originally supposed to be on a different wall, but we decided to build it on this long wall instead so that we would have more storage space for all our toys. The boys’ clothes were also stored in this room. The room was to become the boys’ room when the kids were older. Here is the storeroom looking a little messy with additional suitcases ready for packing. We had the carpenters build shelves to maximise the space. 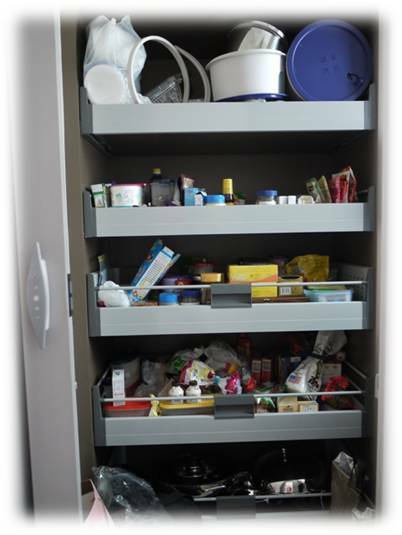 It is amazing how much a well-organised storeroom can store! 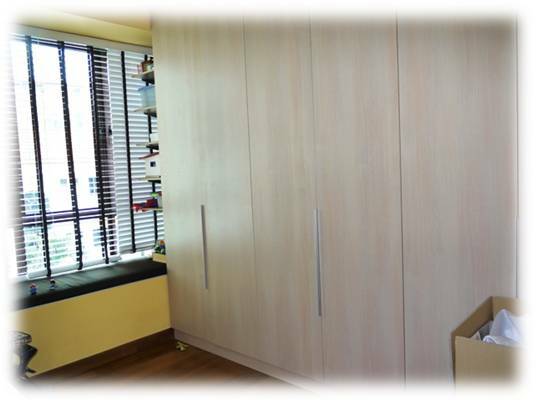 And we bought Blum drawer fittings directly from Blum Singapore (www.blum.com/sg) and had the carpenters put them in. Each drawer can hold a maximum of 30kg. The Amazing Invisible Grilles. Can you see them in the window? These aren’t really “grilles”. More like wires. But they provide sufficient safety (read: the children won’t fall out the window), yet they really are quite hard to see. We got them from Legate and you can look them up at www.legate.com.sg. 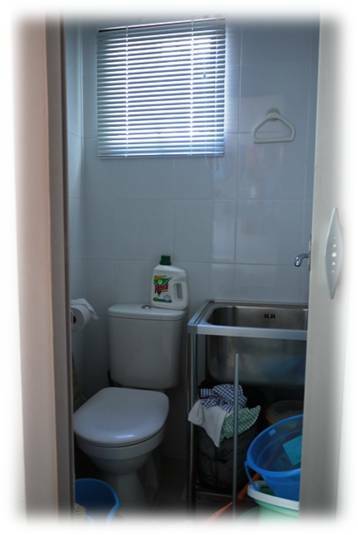 We put them in 3 bedrooms, 2 bathrooms and our small yard/wash area and it cost us S$2588. We had them installed horizontally because we didn’t want them to look like prison bars, but in our master bedroom, they had to go in vertically because the L-shaped bay window didn’t allow the contractors to do the horizontal installation. As it turned out, this was a very good thing, because our bedroom day curtains had vertical lines which camouflaged the invisible grilles! 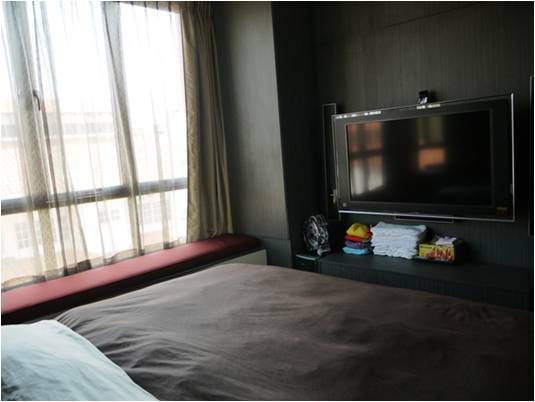 So in that bedroom, the grills really ARE invisible. 🙂 Some people ask if they really are safe since they can easily be cut using a wire cutter. Well, it really depends on who’s trying to get in. If it’s a fireman, you’ll be happy you installed it. If it’s a burglar, the system also comes with an alarm system which will go off if the wires are cut. I have both a washing machine and a dryer. Can’t live without the dryer. 🙂 On the left wall you can see more Song Cho stainless steel shelves for all our cleaning products and hangers. Don’t mind the mess. We don’t ever use this toilet to … well … toilet. 🙂 But I did change the sink in to this industrial-looking one which is SO MUCH MORE practical than the tiny corner sink they provided. You couldn’t even wash your hands properly without splashing water all over the place! With this sink, I can scrub shoes, bleach cloths, dump dirty water after mopping the floor, etc. Highly functional. 🙂 Sink was from the same place we bought our kitchen sink. Hoe Kee on Jalan Berseh. And that brings us to the end of the virtual tour of our home! I hope you enjoyed it! I have a question not exactly related to your home 🙂 but I am really interested in how you manage cooking for Daniel. Do you cook for him separately or is he eating what the whole family is eating already? I have a 1.5yo daughter. As she suffers from chronic constipation, cooking for her becomes an elaborate affair. I keep thinking whether the Thermomix will help to ease the cooking process. It will be even better if I can use the Thermomix to cook for the whole family at one go. Hi Lynn. I stopped cooking specially for Daniel after he turned one. Now he eats what we eat, but before that, I used to just put our food in the Thermomix, add a bit of water or soup, then blend it to the correct consistency. Easier than mashing it all up with a fork or cutting with a pair of scissors. How exactly do you have to prepare your daughter’s meals to cater to her condition? I am still blending a lot of her foods to make it easier to digest for her. I am using a mini-blender called U-like. Because this mini-blender is made of plastic, I don’t think we can put cooked food in it to blend. She is also eating a number of small meals every day – we dare not take the risk of feeding her 3 full solid meals. I keep wondering whether the Thermomix can blend such a small amount of food just for a toddler’s consumption. Pardon my ignorance, but I thought that big blenders require a certain amount to start working. If this can be done in the Thermomix, then I can cook a big pot of soup for adults, choose the ingredients that she can stomach more easily and just blend it in the Thermomix. Is my thinking correct? Hi Lynn, I think Serene gave you much better advice than I could have ever dreamed of giving! 🙂 I guess it helps that she has 7 children and all the experience which goes with that! The Thermomix can blend very small quantities. It can chop like 2 cloves of garlic. And that’s small. 🙂 Yes, you can certainly put soup, rice and other “adult” food in the Thermomix to blend. That’s what I did till Daniel started preferring texture in his food. Lynn – perhaps you *should* stop blending. Perhaps it is that which is hindering her digestive system from working optimally? BTW she could be constipated from too little liquids. You could try adding acidophilus and even digestive enzymes to help get her gut going. Serene, you could be right. In fact, the problem about constipation is that nobody can be sure what is the cause, that’s why it is so difficult to handle. We have made many visits to PDs and many changes to her diet. She is drinking so much water and juices that she is having full diapers every 2-3 hours (and we are using pampers pants). She has taken probiotics as well and that don’t work. Only until recently, we change her milk to Nan HA 3, together with blended foods that her poop pattern starts to improve. But of course, she cannot have blended foods forever, so we will make the transition to bulkier food slowly. Meanwhile, I am exploring options to speed up cooking time as well. And yes, what is digestive enzymes? It sounds interesting but I have never heard of it. Is it something like probiotics? Do I get it at the pharmacies or through prescription? 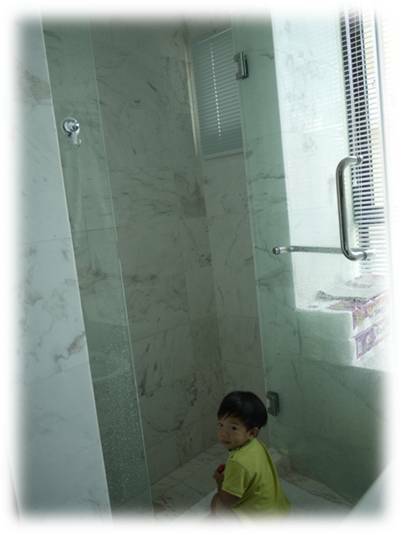 The other cause of constipation is very simple but veyr hard for many Singaporean moms to do – wean child off milk TOTALLY. 🙂 Btw it takes up to 2 mths to fully get rid of the milk proteins from the body so you may not see any improvement till then. Serene, I will consult her PD on the digestive enzymes. Thanks for the advice! Wow!! Impressive and looks soo cosy! Question, question! Before you had the Roomba to do your master bedroom how easy/difficult was it to vac with the normal vac? Or you always had the Roomba once you moved in? 😛 I’m re-planning/organising rooms here but wondering how practical it will be IF I don’t have the Roomba. Impossible to vacuum because there is so little space all round the bed there is no way you can angle the vacuum cleaner under the bed. The Roomba is so good because it cleans well under stuff. So when we moved the bed out, the floor was really clean! Agree agree! Roomba is my best helper! I like your meticulous description on your new home. I’ve never put much thought into home renovation. But your post is truly inspiring. It’s kinda impressive that most of your blog posts are inspiring, and usually persuasive to a certain extent. Just like your post on Thermomix haha. Thanks for the contact, but I haven’t got the time to contact her. 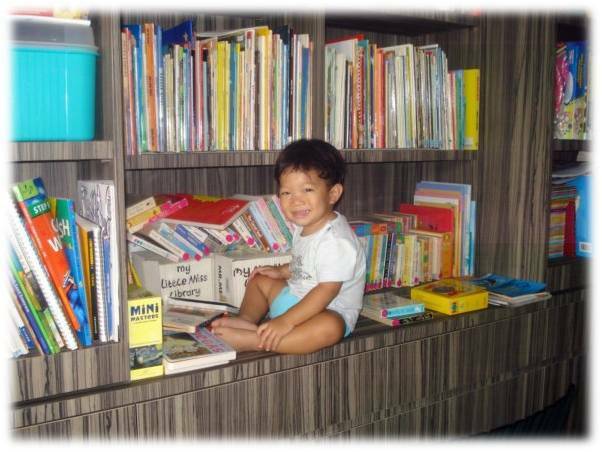 May i know how does a double-volume bookshelves work? And may I know who is your contractor for the double-volume bookshelves? And are the bookshelves expensive? Thanks and enjoy your long stay in Montreal! All the best to you and family! Have a good trip and looking forward to your Montreal posts! Congratulations Frances! 4 is a wonderful number. 🙂 I certainly hope you enjoy your Thermomix and become as addicted as we are! Ours has been shipped to Montreal, and I will miss it terribly for 6 weeks! But we will be reunited in a month! Ha ha. Hi Angie, Lynn here. Thermomix – I am very tempted to buy one. Can you recommend a rep for Thermomix? Thks. I love your post! Thanks for showing “us” around. Please let me know how I can get the Thermomix? By the way, please keep posting. I hv a home-schooling question. My 10yo girl is dyslexia and is hving a tough time in school. I’m looking into home-schooling her but hv no idea where to start. My question is, shld i talk to MOE or must I plan the curriculum first?